Home » Rose Water & Orange Blossoms Blog – Fresh and Classic Lebanese Recipes » Stories and Recipes » Chicken, Fish, Beef, Lamb » Are you a coosa? Many of us at some point or another have called a small child “pumpkin.” Sweet little thing you just want to eat up. My father was someone who enjoyed taking liberties with language, and he developed his own kind of Arabic/English comedian-language that needed no translation to make sense to everyone in our family. I honestly don’t know if it’s commonly used or if Dad coined it himself when he started calling his children “coosa.” Sweet summer squash you just want to eat up. He was a Lebanese father through and through, which meant that his children were his children no matter their age. This fact, along with my petite stature, caused me in my early 20s to work extra hard to be regarded as a Professional Woman rather than the playful girl that resided under my thin veil of suits and heels. But in a moment, in a flash, my father could pull back the curtain and reveal that I was not the Wizard of Oz, but really his little girl. But the look on his face, and that he expressed his love so freely—that’s the kind of memory that you pull out of your back pocket like a well-worn St. Jude prayer card, a solace in desperate times. Now we always ask the delicious little children in the family: “Are you a coosa? !” And they laugh and smile, and know exactly what we mean. The meat and rice stuffing mixture for this recipe is a standard stuffing that is also used for cabbage rolls and grape leaf rolls. I like to use ground beef for this dish, but you can also use ground lamb. If you have the patience to let the coosa rest, after its been cooked, for a day in the refrigerator before eating it, you’ll find the flavors develop wonderfully. Use your clean hands (come on, it feels nice) to combine the meat, rice, salt, pepper and cinnamon. If you are my mother, you will taste the meat raw without a thought of eating raw beef that you didn’t grind yourself, then adjust the seasoning. Or you could do as we learned in culinary school and cook off a sample, a temoine (you never forget those terms you missed on the final exam. That’s one of them, and I am afraid my French may be off even now) in a small frying pan. Or you can just trust my measurements above and go with it. 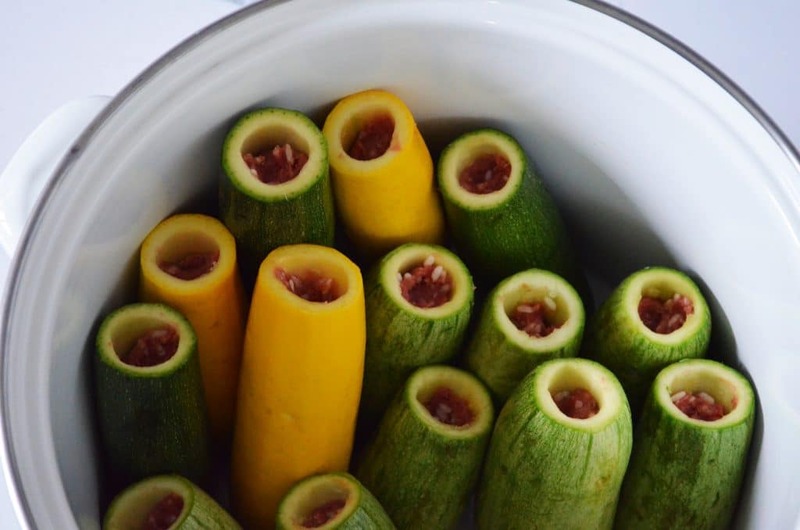 Loosely fill each coosa with the stuffing. Loosely is the key word here, because the rice does not like to be crowded. It needs room to expand, so fill only about ¾ of the coosa with stuffing, and don’t pack it in. You may have leftover stuffing that you can form into meatballs to be cooked with the coosa. 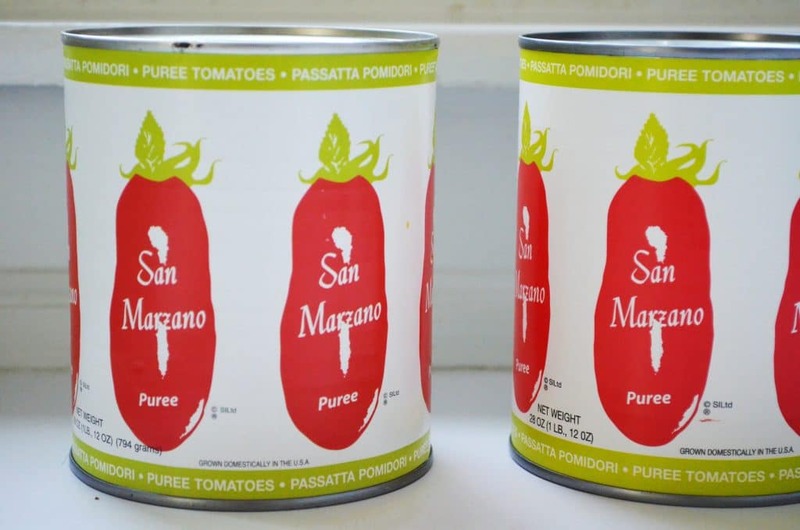 In a bowl, season the tomato puree or sauce with ½ teaspoon salt and pepper. Place the coosa (stuffed end up but tilted so that you don’t need as much liquid to cover them) in a tall pot with the garlic cloves interspersed and the meatballs on top. Pour the tomato puree over all. Pour water over that until the coosa and meatballs are just covered (some can stick out a bit above the liquid). Cover the pot and bring the liquid to a boil over medium heat. 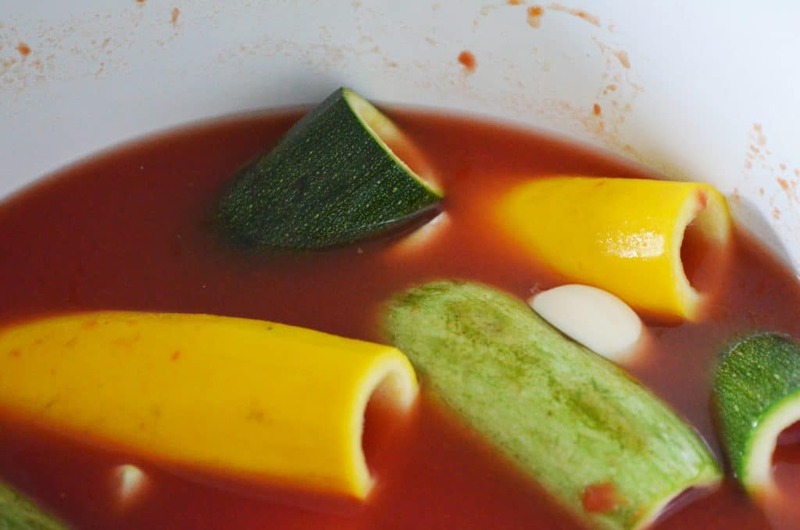 Reduce the heat and simmer until the squash is tender and the meat is cooked through, about 50 minutes. Remove the coosa to a serving bowl and taste the sauce. Adjust seasoning, adding salt and pepper as needed. Serve the coosa in individual bowls or on plates with the sauce spooned over it. You can also make a cut down one side of the coosa with the side of a spoon and ladle the sauce over that, to whet the whistle of the stuffing. Top with labneh (thickened yogurt) and eat with thin pita bread or Lebanese flatbread. 38 Responses to "Are you a coosa?" Maureen, this dish looks fabulous…comfort food at it’s best! The story of your dad is so heartwarming. I am sure he is missed greatly by many. Thank you Maria–comfort food is a great description for this dish! Hi Maureen,I love Lebanese food as both of my grown children have a lebanese father and had their sity and jito until they passed away,they always want me to make kibbee naya but I forgot how many times my mother in law had put the meat through the grinder so it’s fine enough.I make my own hummus and tabouli still and lost my lebanese cookbook that we bought from Our Lady of Lebanon in Waterbury/Prospect Connecticut,if you know where I can find a cookbook and where to get the meat ground I would be ever so grateful and so would my kids.Thanks and can’t wait for some local squash to make Coosa Mehshee !!! Hi Susan–a lot of the churches have done those great cookbooks and they go out of print. You will find all of the info you’re looking for in MY cookbook though! It’s coming out next spring. 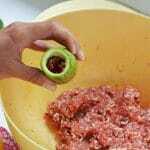 See my post here about how to grind the kibbeh meat. A lovely story! And I love your vibrant photos too! Your dad sounds so Lebanese and I so enjoyed that story! Of course, my kids cringe (son especially) at any display of even the most discrete affection in public. Oh well. Great post. I am so very happy to learn that the unusual languages that fathers speak to their daughters live on in fond memories. The father that invents a special form of speak for his daughter truly loves her, Director, or otherwise. For a Pop, speaking Coosa is the gateway back to childhood itself. Your girls will always love their father’s unusual language. Hello Sweet Cousin, your dad, would have been my Uncle “Coosa”. Absolutely, tender, sweet and filled with rare ingredients. Memories of him bring a smile to my face, ache in my heart, and yearning to be in his presence again. What laughter, I can still hear his chuckle!!! Love you all. Meg, I’ve just read your beautiful note to my mother. You’ve brought us both to tears. We love you. 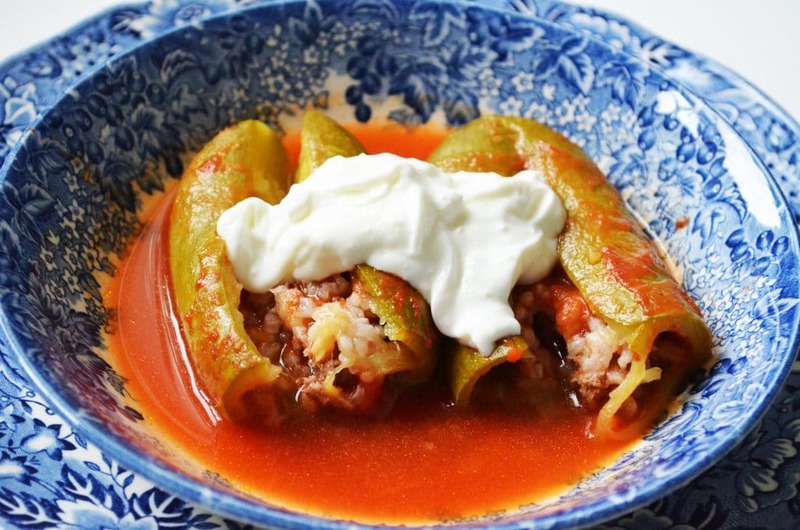 Hi Maureen, Just made stuffed peppers — a Bosnian/Croatian standard — for my husband Alija. The recipe is very similar to yours, including the secret of cinnamon in the meat. Of course, I must add Vegeta as well (because no modern Balkan dish is complete without it)–but I use it very sparingly. The peppers were pale green, fresh picked from an Indiana garden, and I made the sauce from fresh picked tomatoes. The peppers were stuffed with cooked ground beef (sauteed with onions and garlic) and wild and long grain rice. Yummy. You’re right about them tasting even better the next day. It’s great to have leftovers the family will love. Hi Patrice! Your peppers sound divine, love the wild rice mixed in, and I’m curious about the Vegeta…I will try it sometime. Love stuffed coosa… This year I grew white coosa. My plant center called them Lebanese squash. I was so excited to find them. My Uncle Lucas grew these for the family years ago when he still raised a huge garden. I follow the same basic recipe you have and I also add some pine nuts. Thank you for all your great recipes. I feel so lucky to have found your website. I really love it! Lebanese food is my absolute favorite and has been for over 20 years since my daughter married into your culture. She is a fabulous cook and many ( even Lebanese) have asked her why she doesn’t do catering. She is very artistic and so her food is always presented beautifully. She is in Beruit right now visiting the Tanoukhi family. She cooks very much like you do ,which is another reason I love your site. Btw, I made some kale chips the other day using zataar. They turned out fabulous!! I’m in Georgia, my Julie is in Youngstown and you are way up in Michigan so the chances of meeting are slim. Just thinking about this wonderful food, though, brings both of you to mind. Karen, how very special. I would love to meet you all…come on up north! I have relatives in Youngstown, the Shakers. What a great trip your daughter must be having right now, and how jealous I am! Please give her my warm regards, and the same to you. I wish I knew what happened to the corer either my Grandmother or Mother used. I’ll bet my Grandmother’s cored several tons or more of coosee (as we pronounced it) and my Mother’s did a bunch. The corers were almost impossible to buy and they were a prized kitchen possession. Over the winter my Mom’s would get lost in a drawer and when Dad brought in the first coosee of the season all of the kitchen drawers go cleaned until it was found. Actually Mom didn’t use it so much. She would say “I’ll cook it but anyone who wants it will have to core it.” So Dad would set down at the kitchen table with a bucket of squash at one side and a bucket of innards between his legs and core every one. Whatever we couldn’t eat fresh was originally salted and put in a crock in the cellar but later frozen. So we had coosee all winter. Your recipe is very close to what we had except for the garlic. Mom wasn’t much into garlic. However one of my Aunts loved garlic and it was in everything she made. The other thing is Mom used a pressure cooker rather than open pot. I don’t know if this did anything other than make it faster. Stuffing is great if one has the time and wants a good looking presentation for guests, but having been a bachelor a long time, I just cube the squash, sliver the cabbage, or whatever to anything else that would be traditionally stuffed and add the rice, meat, etc. After cooking it doesn’t look the greatest but tastes the same and saves lots of time. I don’t eat beef or lamb, any suggestions how to make this vegetarian? Thank you. 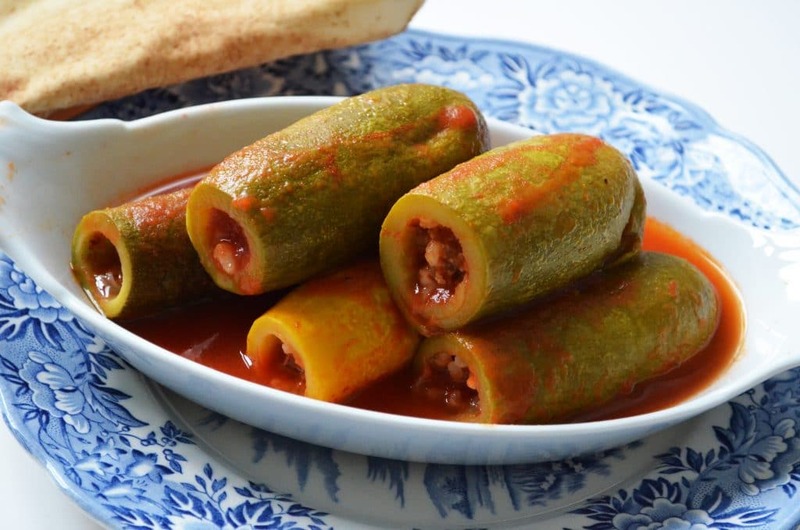 Hi Edith–you can use the filling for my vegetarian grape leaves, recipe is here, but also my upcoming cookbook has other vegetarian stuffing recipes I think you’ll love! I make a similar recipe using eggplant. Luckily I have a Lebanese grocery nearby and find lots of interesting ingredients. I’ll definitely give your recipe a try. Love Lebanese food. Hi Maureen! I’m loving your cookbook! My Syrian-heritage (great-grandparents “came over on the boat”) husband says I’ve been converted! I was wondering, with this dish specifically, is it possible to core and stuff the squash a day ahead and put it in the fridge until time to cook? I wasn’t sure if the cored squash would “wilt” or if the rice would absorb too much moisture from the meat. Thank you for sharing your recipes! I have frozen it this way but haven’t refrigerated–I suspect it will be just fine! Thanks so much Lisa! Thanks for this recipe! Very great! Thanks for this! I think the ratio is a matter of preference, and so too with the rice. I have taken to using medium grain rice and like how it comes out very much with a 1-1 ratio, so 1 cup of rice to 1 cup of meat. Hope you’ll make it and enjoy! I’m going to try your pomegranate molasses idea in the sauce–sounds so good. My mom made this, she would save the insides of the squash you removed when making the coosa and mix it with eggs for breakfast. I think she called it fud-a-key. Do you know a recipe for that? Yes Mike! That recipe is in my cookbook, but I’ll put it on my list for the blog too. My mom calls it “ijeh” but fudakeh also sounds familiar. Wonderful story! My mom picked over 6 dozen koose/cousa/coosa 2 weeks ago and we had our first batch of the summer. Soooooo good!! Thanks for writing down the recipe. Lucky you!!! They’ll be delicious! Hi Maureen, do you ever put lemon juice in the sauce? Have not done that but it sounds like a great way to add more of the tang I love! My mother passed away in December. Your blog makes me feel close to her as I read through all the recipes she made me. Thank you…. Rest her soul Tina. I’m honored to know my work can give you some comfort and connection with your mama. Maureen, love the recipe. In Honduras there is a very large Palestinian population going back to ends of 1800’s. There they call this dish “Pipianes” and they’re fabulous! This was a huge success! Coosa makes me think of my great-grandmother, and it made me really happy to make this. I definitely recommend letting it sit overnight to let all the flavors soak in. Thank you for sharing your recipes! Hurray! Thank you Rosine! Agreed, day 2 is sooo good, if you can wait that long (or have any left over! ).